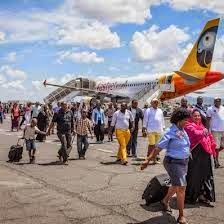 fastjet operations in Tanzania have reported a record number of passengers in August 2015, carrying a total of 76,741 passengers during the month. The load factor for August was 75%. The increase in passengers is in part due to the new routes to Malawi introduced in July 2015 and to increased frequency on some existing routes. Punctuality for August remained strong, with 88% of flights arriving on time Note 3. This was lower than last month, mainly due to unexpected airfield closures in Dar es Salaam for military training. Ed Winter, Chief Executive Officer of fastjet, said: "We are delighted to report record monthly passenger numbers for the second consecutive month, further affirming the growing appetite for low-cost aviation across southern and eastern Africa. August is traditionally a strong month but with a capacity increase of 23% versus August 2014, we are delighted to maintain such strong demand." 1. "Passengers" are sold seats flown, excluding infants. Fastjet bookings are generally non-refundable. 2. "Load Factor" is the number of 'passengers" as a percentage of the number of available seats flown.